In February 1964, Phil Gardner started his business selling aircraft. Today, Gardner Aircraft Sales' level of quality is the result of Phil's experience in the general aviation industry, culminating over the last 50 years. In his long aviation career he has been in thousands of cockpits, piloting a wide range of aircraft. As a result, he can offer an uncommon level of expertise with invaluable experience and aviation knowledge. 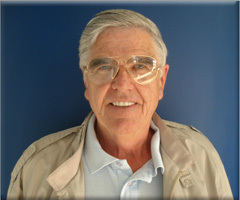 His long career also includes many years spent refinishing aircraft interiors and custom paint work. We invite you to benefit from Phil's experience in finding the best aircraft, at the best price that fits your needs. Grant Desmarais began to fly at the age of fourteen in Cape Cod, Massachusetts, where he worked to put himself through a local flight school. As a young man, he continued to fly and study aviation. His greatest dream was realized when he was accepted to Embry-Riddle Aeronautical University in Daytona Beach, Florida. There, he attained his Bachelor of Science Degree in Business Aviation. Grant continued to complete his Masters Degree of Business Administration in Aviation in 2008. Grant is currently a commercial, multi engine, and instrument rated pilot with a wide range of experience in different aircraft. Grant's life long obsession with aviation, along with his passion for meeting new people, brings energy and enthusiasm to the sales team at Gardner Aircraft Sales.